Pinterest looks likely to be the next unicorn to dive into public trading. The multibillion-dollar image search site filed its S-1 in late March, and is expected to set pricing in the coming weeks. 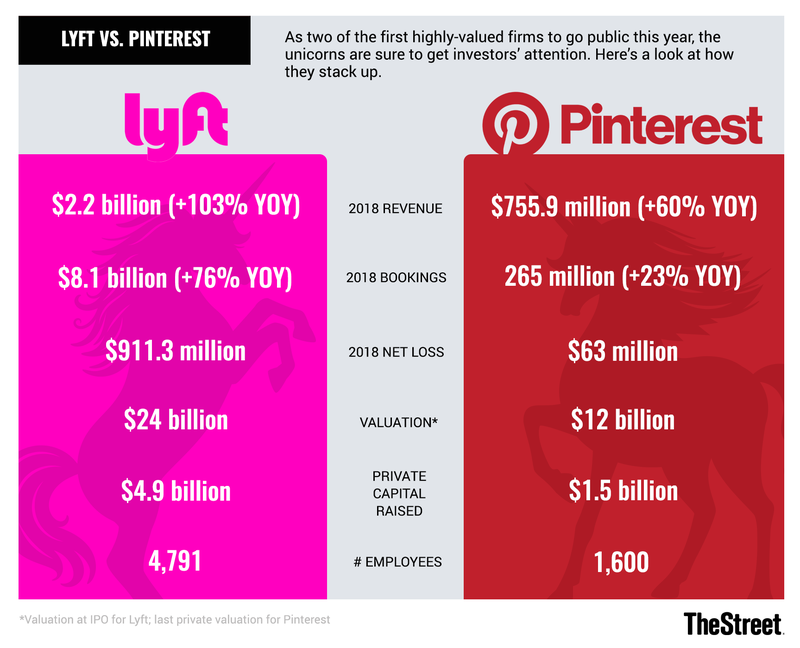 Following Lyft, which went public last Friday, Pinterest could very well be the second high-profile, high-growth tech firm to make a public debut this year. Lyft (LYFT shares were down 11.85% on Monday. Now the question is how should investors size up Pinterest. Earlier reports suggested that Pinterest, Inc. is seeking a valuation of $12 billion in its IPO, and the company disclosed a number of positive trends in its recent filing. Its revenue rose 60% in 2018, to $755.9 million; and in a seasonally strong fourth quarter, revenue was up 58% year-over-year to $273.2 million. At 265 million monthly active users, its user base is still growing at a good clip, particularly outside of the U.S. As noted by RealMoney columnist Eric Jhonsa, Pinterest still has a lot of room to grow in monetizing international users. Pinterest, which makes money through promoted pins and other forms of advertising, has no direct peer in the public markets. But other advertising-led social media firms are a useful point of comparison for investors, said Duckju Kang, CEO of consumer finance research firm ValueChampion. "Twitter and Snapchat serve as very natural reference points: they are all 'smaller' social networks with a strong presence within their niche markets while also facing stiff competition from Facebook (FB - Get Report) ," said Kang. Although Pinterest wouldn't describe itself as a social network, it shares some similarities with Twitter (TWTR - Get Report) and Snap (SNAP - Get Report) . The three are roughly comparable in size, at 247 million, 329 million and 187 million users respectively. And all three earn revenue by selling ads on their user bases. In an analysis of Pinterest's IPO prospects, Kang noted that it's tricky to make an apples-to-apples comparison among the three platforms, in part because of their differing stages of monetization as well as differences in disclosures. (For instance, Pinterest and Twitter report monthly active users, while Snap reports daily actives.) But assuming that Pinterest garners a valuation of $12 billion in its IPO, weighing its market cap per user compares favorably to Twitter and Snap. There are other differences between Pinterest, Snap and Twitter: Pinterest's operating costs are significantly lower than that of its peers, potentially a good sign provided that it can execute its monetization goals. "If Pinterest is able to generate similar revenue from each of its users as Twitter, it has a very good chance of being highly profitable due to its extremely low cost base," he added. "For instance, Pinterest's R&D expense is only about 30-50% those of Twitter and Snapchat. Similarly, its G&A expense is 16-26% of those of its peers." There's another big difference between Pinterest and some of its social media counterparts. Unlike Snap, Twitter or even Facebook's Instagram, many Pinterest users are specifically there to shop. A recent Cowen survey, for example, found that 48% of U.S. Pinterest users said they use Pinterest to find and shop for products, compared to 14% for Facebook, 10% for Instagram and 7% for Twitter. In its S-1 filing, Pinterest called out the natural alignment between advertisers and Pinterest users as one of its main competitive advantages. "The mutually beneficial alignment between advertisers and Pinners differentiates us from other platforms where ads can be distracting or annoying. We are still in the early stages of building an advertising product suite that fully taps the value of this alignment between Pinners and advertisers, but we believe it will be a competitive advantage over the long term," the company wrote.